Amazing graphic and article on how we have seen technology expand exponentially in fulfillment of Daniel’s prophecy. We have an amazing ability to transfer of knowledge! You almost certainly use it every day, but until now nobody has really known what the internet actually looks like. However, Fortune magazine and graphic designer Nicolas Rapp teamed up with telecom data and infrastructure company GeoTel Communications. The company maps fiber optic cables and geographic information systems (GIS) that connect people all over the world, which were used to create the stunning image below. It shows the key locations for fiber optic cables, the high speed connections that form the backbone of the internet. 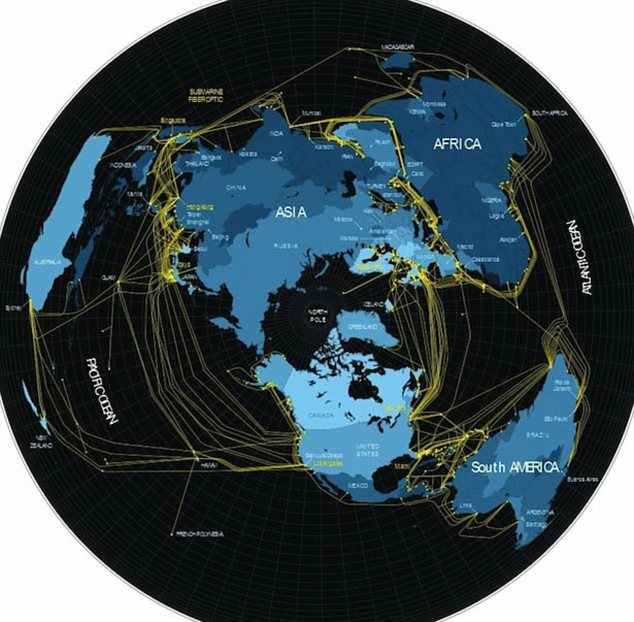 What the Internet really looks like: Each yellow line is one of the major fiber-optic cables that carry Internet traffic around the world. These are the ‘plumbing’ of the internet, and many are routed undersea. It also reveals that much of the online world is actually underwater, and under the world’s largest oceans. These cables transfer data in the form of light to and from power repeaters in major cities — such as Hong Kong and New York — in a matter of milliseconds.